From route 3 in Groveton turn onto route 110. Turn left onto Emerson road. Continue on Emerson Rd bearing right at the Y to the end. Turn Left onto the gravel Nash Stream Rd and follow it 2.7 miles to the Percy Loop Trailhead. Cross Long Mountain brook and there is a small parking area to the left. Do not block the gate. 2 hours 45 minutes from Manchester. NOTE: I ascended Percy via a Northern route not on your traditional AMC Maps. 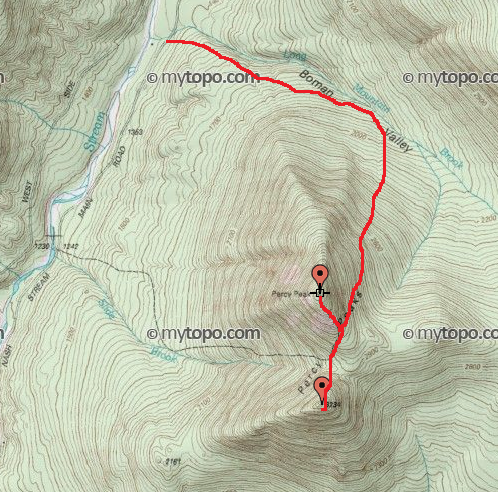 I ascended the Percy Loop trail a few miles north of the traditional Percy Peak Trail. From parking cross Nash Stream Rd and follow the Percy loop trail (also the Cohos Trail), sign the hiking register 100 yards from the trailhead and follow the carriage road with easy footing over a moderate grade. The trail parallels Long Mountain brook and ascends moderately providing a few light lulls during the ascent to give your lungs and legs a minor rest before continuing it's moderate incline. After approximately 1 mile the trail follows an elevation contour line and level for approximately a third of a mile then the trail reaches a brook, turns right, makes a short, steep ascent before reaching a campsite area to the left. From here the easy footing becomes technical ascending a single track trail over rocky terrain as the hardwood forest transitions to birch and eventually primarily fir trees. After 1.8 miles you reach a trail junction with the Cohos Trail. Bear right following the Percy loop trail through a narrow and rocky path to the base of the N Percy Slide crossing extremely steep and open granite ledges. The 3430 Ft summit is a very short distance from the top of the steep pitch and marked with a summit sign and USGS Benchmark disk. N Percy offers great panoramic views from the summit. Carefully descend the granite slabs following the poorly marked mustard trail markers and few cairns. If you happen to lose the trail stay to the left. Head back to the trail junction and descend into the col between the two peaks. After 0.1 miles you reach a second junction with the "Old Summer Club Trail". Bear left at this junction and at the low point of the col where the trail bears left look for a herd path heading straight up the flank Of South Percy. The herd path is not marked but well traveled. It's overgrown, steep and rocky but easy to follow 0.25 miles to the South Percy Summit. The summit is obvious and marked with a glass jar tied to a tree near the highest point. There are good views of North Percy and the surrounding area. Return the way you came. NOTES / COMMENTS: After hiking Mt. Sugarloaf earlier this morning my legs and energy levels were feeling the burn during this hike. The trail crosses a variety of terrain from a carriage road with easy footing to a rocky and rooty single track to open granite slabs. Both peaks are listed on the NH 3000 Footer list and North Percy Peak is #15 on the 52 with a view hiking list.